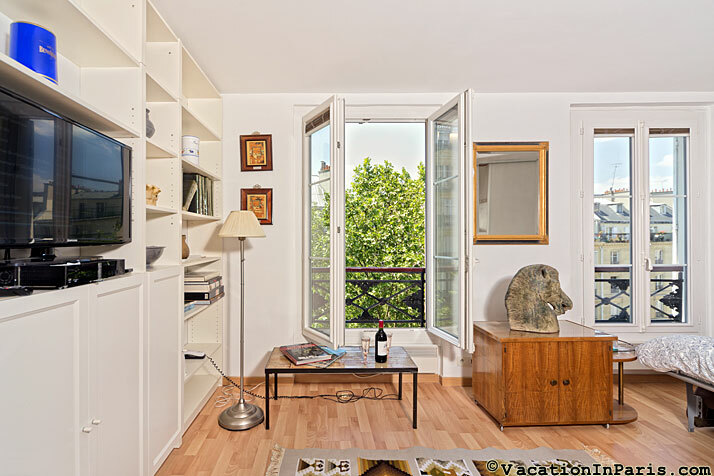 This elegant 24 m2 studio, on the upper east edge of the Marais, is only a few minutes walk to the hip and fashionable shopping streets in the oldest neighborhood of Paris. Come and see this wonderful neighborhood for yourself! 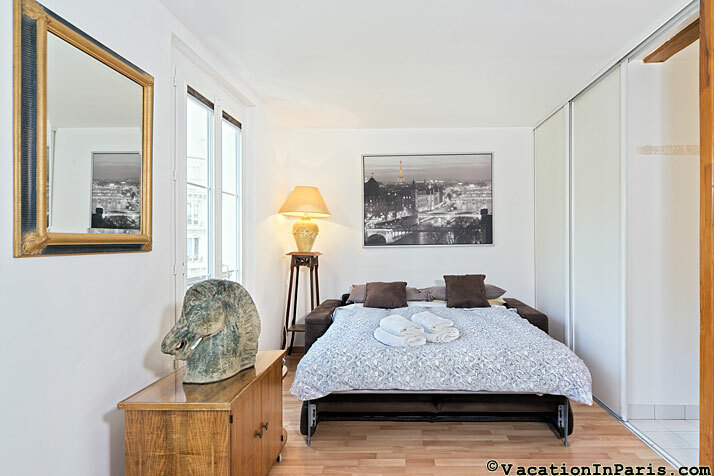 5 night minimum stay. Prices are in US$. 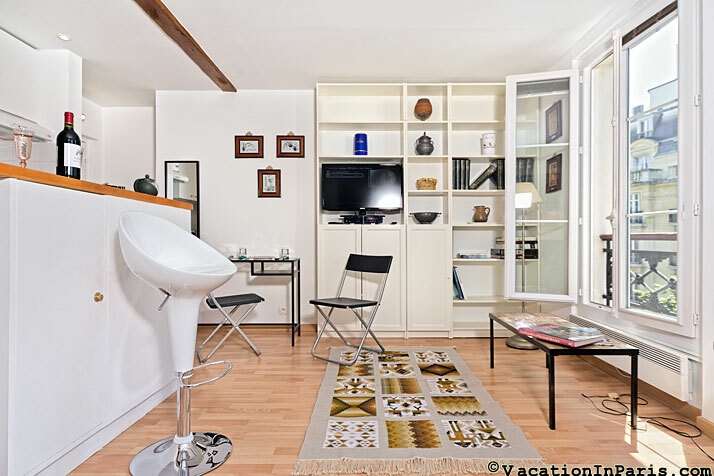 This handsome studio apartment is light and airy located on the 5th European (6th US) floor with an elevator. 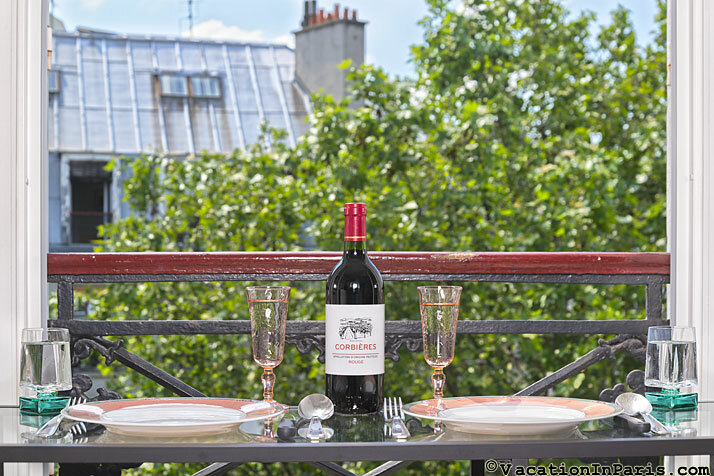 From the windows you'll have a pleasant view over trees and rooftops and of the picturesque tree lined square featuring a statue entitled "Turenne Enfant”. 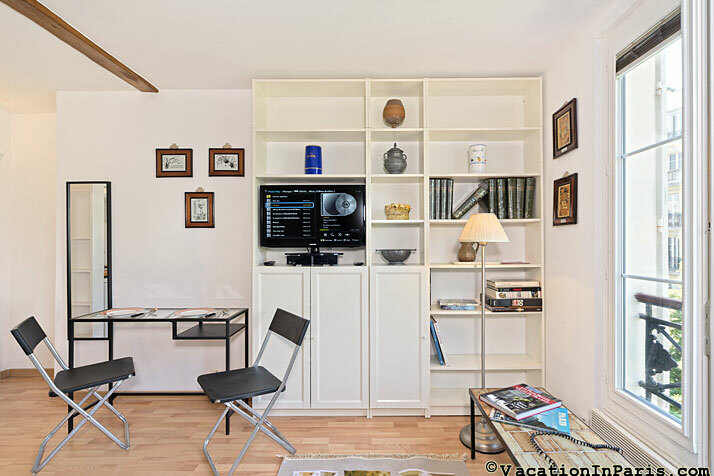 What better place to call your home away from home? 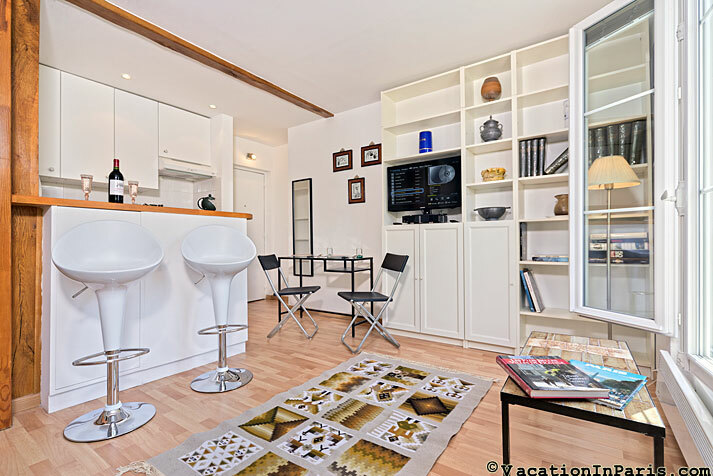 The apartment is tastefully decorated with white walls, parquet floors, a queen sofa bed that will sleep 2 guests comfortably, and an open kitchen separated from the main room by a counter. 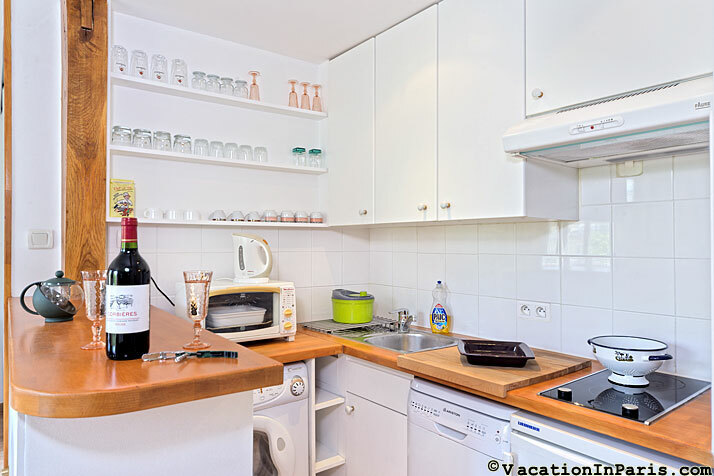 The kitchen area is compact, but will offer everything you'll need for your stay, from the 2 burner induction stove top, coffee maker, to the dishwasher. It's just right for a light meal and an easy clean up. There's even a washer/dryer combo should you want to do your laundry before making your way back home. 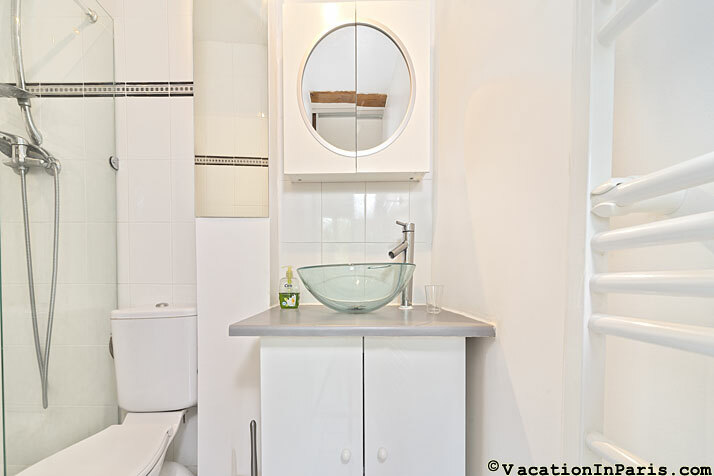 The bathroom is done with clean white tiles and offers a modern feel with the glass sink bowl, shower, WC and towel warmer. Historically, the neighborhood is known for its wide selection of tailors and fabric stores, which you’ll see along many of the surrounding streets. You also have the famed Cirque d’Hiver, well worth a visit, just a couple of blocks away. This is one of the oldest circuses in France and once inside you will be in awe at its traditional French décor. 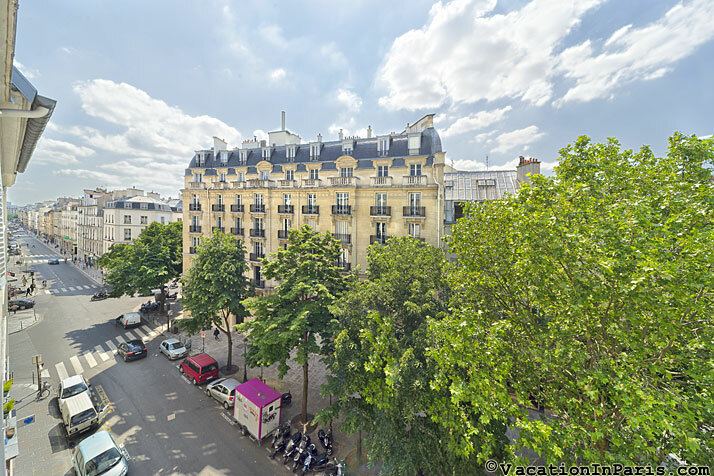 Stroll over to the rue de Bretagne where there is a great market called "Le Marché des Enfants Rouges"…..This market dates back to 1615, to the period of King Louis XV. 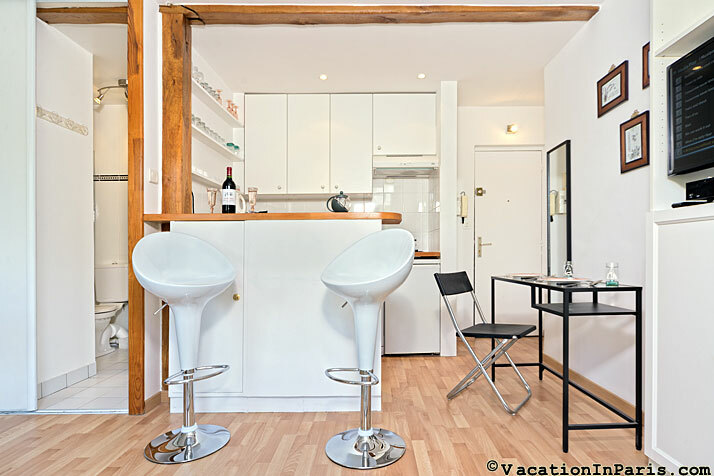 You’re only a few minutes from Republique with a wide choice of metro lines including 8, 9, 3, 11, and 5. 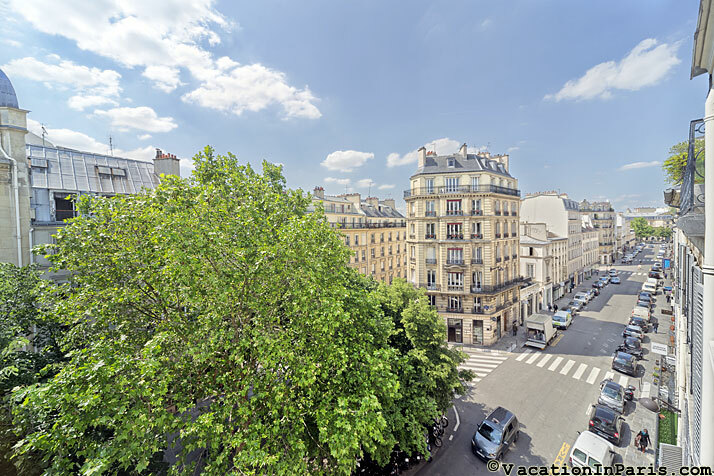 Your nearest metro stop from the apartment is on line 8 at Les Filles du Calvaire, which takes you directly to the Opera Garnier, Place Madeline, and Concorde, plus the Invalides and Eiffel Tower areas. 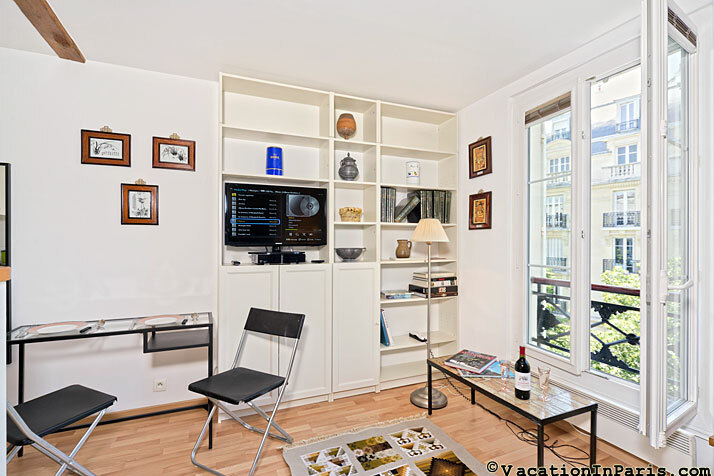 You’ll definitely enjoy this stylish studio apartment in such a typically Parisian neighborhood – with so much to see and discover at hand, and so easily accessible to all of Paris. 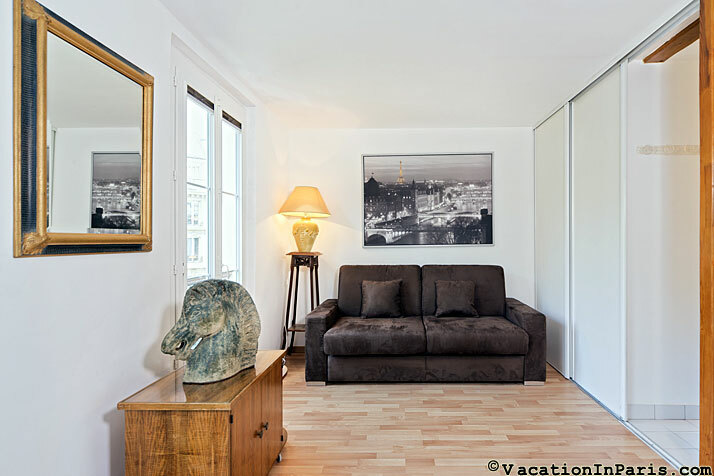 This apartment is a "Meet and Greet" - guests will be met at the apartment and given keys at that time.